Dress up your North Myrtle Beach vacation by making beach vacation reservations for Beach Cove Resort. This oceanfront retreat is fabulously located in the Windy Hill section of North Myrtle Beach, South Carolina. It is near Myrtle Beach area golf courses, a popular mall with Bass Pro Shops and Islamorada Fish Company restaurant. This North Myrtle Beach resort consists of three high-rise towers that zig zag along the oceanfront for optimum views of the Atlantic Ocean from within its walls. This North Myrtle Beach resort boasts condominiums by the sea that feature one, two or three bedrooms. These condos all boast a well equipped kitchen with a microwave, coffee maker and all the cookware you might need during your stay. These condos in North Myrtle Beach, SC have a washing machine and clothes dryer in addition to high-speed Internet access. Best of all, each North Myrtle Beach condominium at Beach Cove Resort has an oceanfront balcony with stunning views. You will be as comfortable in these North Myrtle Beach rentals as you will be outside at Beach Cove Resort. On the beach that spans in front of Beach Cove Resort you may rent beach umbrellas and beach chairs for the duration of your North Myrtle Beach vacation when you visit in the summertime. Take long walks as the sun sets and get up early to see an oceanfront sunrise during your stay at Beach Cove Resort. On the ground level of this oceanfront North Myrtle Beach resort is a large deck with numerous swimming pools that extend from one end of the first tower to the far end of the third tower. Chaise lounge chairs blanket the sun deck so you can relax easily during your North Myrtle Beach vacation. When the sunshine gets a little too warm for you, just hop into the nearest swimming pool for a refreshing dip. 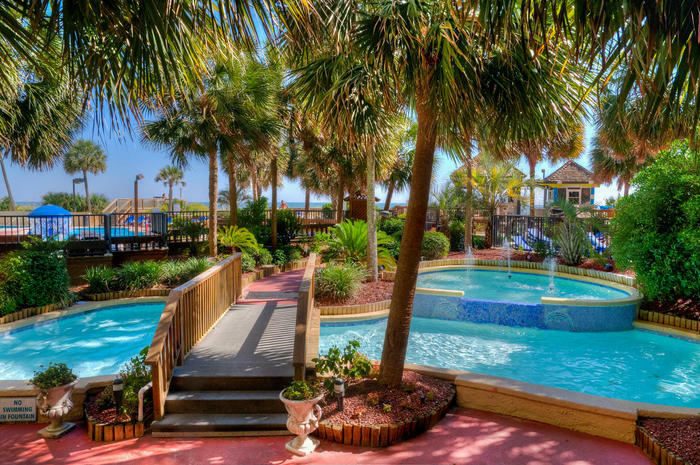 This North Myrtle Beach resort also has more than one hot tub, which you will appreciate after playing 18 holes on a nearby North Myrtle Beach golf course or shopping all of the stores at the nearby outlet malls. Elliott Beach Rentals is not affiliated with onsite management or the HOA of Beach Cove Resort.